This product was added to our database on Tuesday 21 October 2003. 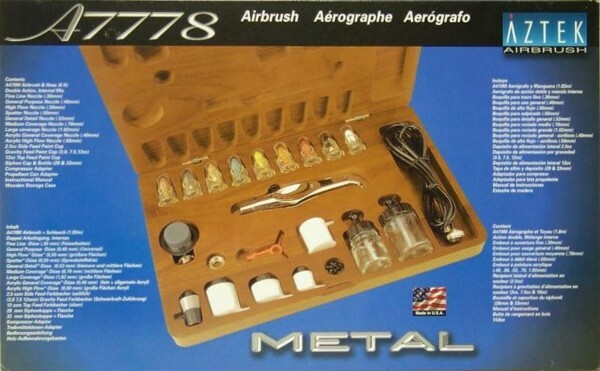 Heavy metal airbrush kit With its new dual-action, internal-mix A470M airbrush, Aztek has released what is probably the most complete airbrush setup on the market. Inside the beautiful wooden case are nine detail nozzles, adapters for propellant can and compressor use, seven color cups and a generous, 6-foot hose. The 470M is a metal version of Aztek's plastic-body airbrush, and it certainly lives up to its "heavy" nickname; the brush's meaty 4 ounces gives it a very balanced feel. Another nice feature is the long trigger moment that makes it a lot easier to get the precise flow you need for fine, detail work and broad coverage.